I love my morning coffee, but sometimes I like to switch things up to this collagen-filled Bone Broth Turmeric Latte. 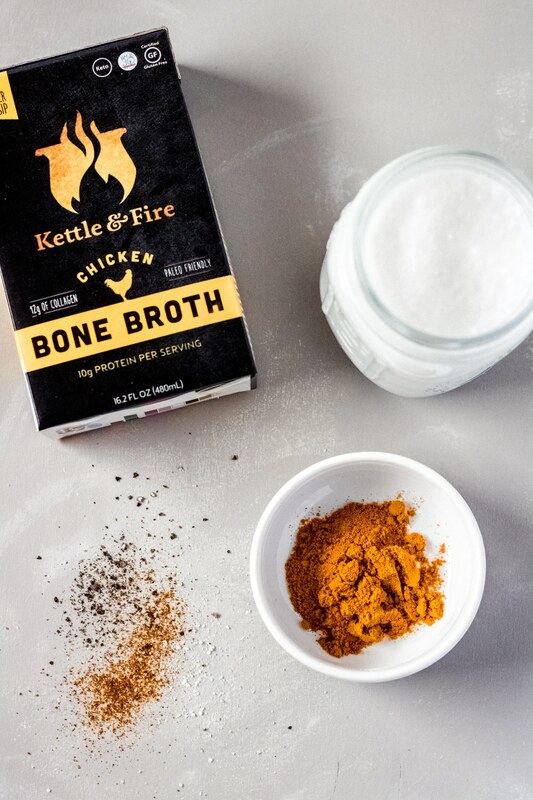 When creating your own bone broth recipes the possibilities are endless! Bone broth doesn’t have to just be for winter soups or heavy comfort foods – you can enjoy bone broth year round. Bone broth has some amazing health benefits – as does turmeric – so why not start your morning with a creamy bone broth turmeric latte? I know, I know – giving up your morning coffee for some of us can be hard. But, once I started rotating this bone broth turmeric latte into my rotation I found myself looking forward to it. Plus, it gives me a boost of both collagen from the bone broth and the amazing nutritional benefits of turmeric. What does it taste like? To me, it tastes like sipping on a warm cup of chicken noodle soup minus the noodles. 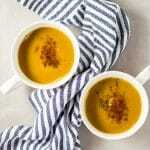 The coconut milk gives it a thick, velvety texture while the bone broth and turmeric give it a nice savory flavor. Add all of the ingredients – except the cayenne pepper – to a small saucepan and whisk to combine. Bring to a boil over medium-high heat. Then, reduce heat to low and simmer for ten minutes – stirring occasionally. 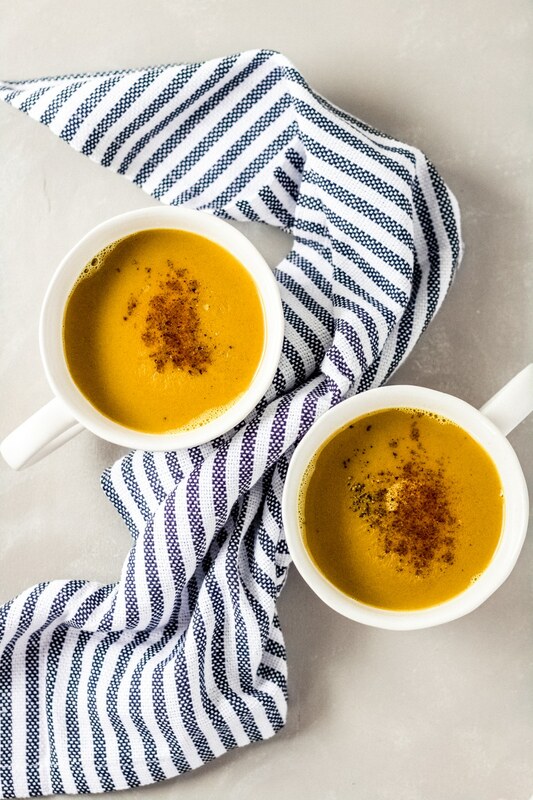 Pour the bone broth turmeric latte into a mug, top with additional cracked black pepper and a pinch of cayenne pepper and serve immediately. Is it safe to take turmeric every day? Turmeric is safe when consumed in amounts found in food, such as in this recipe. Large doses of turmeric may have side effects. Additionally, turmeric may interfere with certain medications, if you have any questions, please consult with a medical professional. When should I drink bone broth? Any time of day is fine to consume bone broth. Which is better – chicken bone broth or beef bone broth? Chicken bone broth is higher in protein but may contain less collagen, depending on the specific chicken bones that were used in the making of the broth. Chicken bone broth is easier to digest and has a lighter taste, which is why we chose chicken bone broth for this recipe. Whereas, beef bone broth is higher in minerals. Both have health benefits so it comes down to personal preference. Can I freeze the bone broth turmeric latte? Yes, you can make the latte ahead of time or in large batches and freeze in an air-tight glass jar. To reheat, place the jar into a pan of hot water until the contents begin to thaw and can be broken up. From there, dump the latte into a saucepan and warm over medium heat. The texture may be a bit grainy. Enjoy these gluten-free breakfast recipes with your latte! 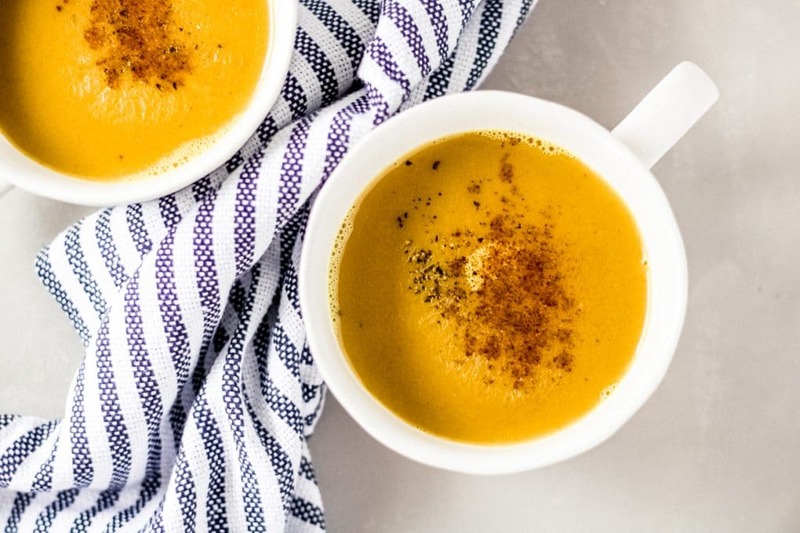 Switch up your morning drink routine with this collagen-filled bone broth turmeric latte – both gluten and dairy free. Add all ingredients except the cayenne pepper to a small saucepan and whisk to combine. Bring to a boil, then reduce heat and simmer for ten minutes – stirring occasionally. 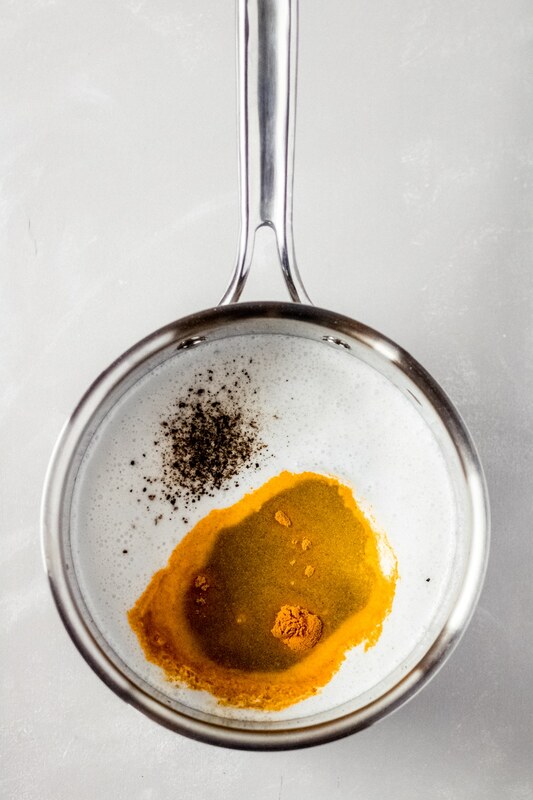 Pour into a mug, top with additional cracked black pepper and a pinch of cayenne pepper and serve immediately. Be sure to only used canned coconut milk. Be sure to use chicken bone broth – not stock or regular broth.